The kingpin of TREMEC’s high performance line-up, the T-56 Magnum takes state-of-the-art OEM technology and pairs it with the most popular features of our all-business TKO. Like a 6-speed sledgehammer in velvet gloves, the Magnum easily tolerates up to 700 lb-ft. of tire devastating torque, and does so with unbelievable sophistication––providing short, crisp shifts and a rewarding driving experience. Known in its OE form as the TR-6060, the Magnum is an aftermarket version of the same transmissions found in many of today’s most revered factory supercars; meaning refinement where you want it and strength where it counts! 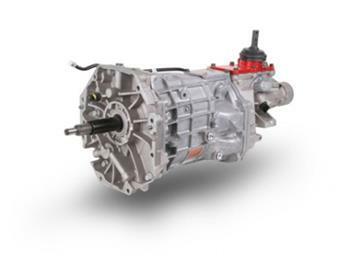 Except for their gear ratios, these Tremec T-56 Magnum manual transmissions are truly brand new from the ground up. They can withstand up to 700 ft.-lbs. of torque, with gears featuring substantially increased face widths and 2-piece laser-beam welded construction, allowing for greater control of the tooth angles, pitch, and alignment.